Cheers guys, went out Saturday night, been for an ice cream today, off to the new Japanese restaurant and bowling this evening, and off to Pizza Hut with the family tomorrow Film-wise I have received The Terminator and Sightseers. gasteropod wrote: Cheers guys, went out Saturday night, been for an ice cream today, off to the new Japanese restaurant and bowling this evening, and off to Pizza Hut with the family tomorrow Film-wise I have received The Terminator and Sightseers. Happy Birthday Gas. You've received not Criterions? For shame! There's a sale on at amazon as well! Shingster wrote: Happy Birthday Gas. You've received not Criterions? For shame! There's a sale on at amazon as well! Thanks Salty & Shing, wow the Japanese restaurant was ace - fantastic food and service, only thing I wasn't keen on was the eel as it had a strange flavour but glad I tried it anyway. Happy Birthday Grim! Anything fun planned? Gifts? Personal goals like taking off to another part of the world? Mine is coming up in a few days (May 30 ); I forgot same as cal42 (was part of HKMDB now doing standup somewhere in England). Last edited by Masterofoneinchpunch on 21 May 2014, 22:14, edited 1 time in total. And of course a Happy Birthday to the salty one! Hope you are a having a fun day. Belated Happy Birthday dude! Enjoy the holiday, sounds like the right way to celebrate turning 50 to me! I don't understand why we even celebrate birthdays. We should celebrate every other day and keep birthdays for mourning our impending mortality. wow that year flew by.i guess the saying time seems to go quicker as you get older is pretty accurate. Another belated Happy Birthday Salty! 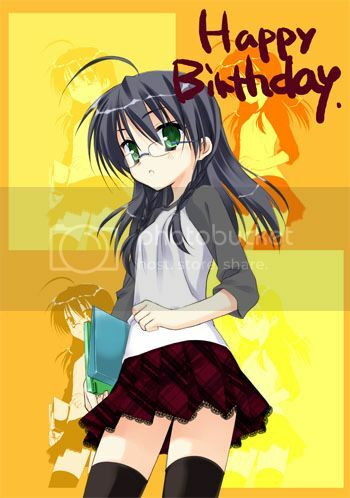 Otanjoubi omedetou! How old are you Hung? 45? 46?